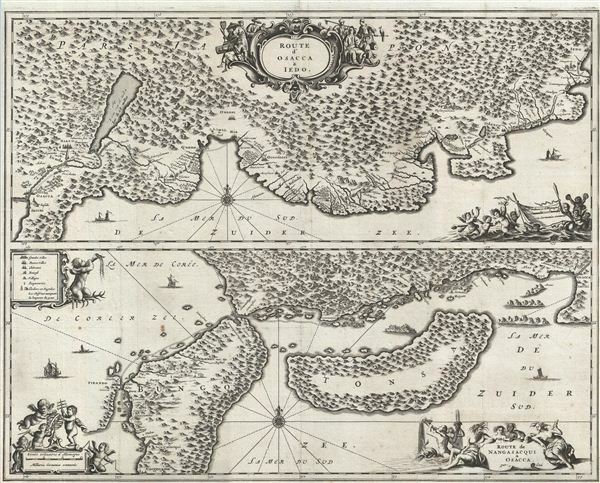 One of the earliest known maps to identify the 'Sea of Korea'. Route d'Osacca a Iedo. / Route de Nangasacqui a Osacca. An extremely uncommon 1669 map of parts of Japan between Osaka and Yedo (Tokyo), and between Osaka and Nagasaki. This map was drawn by Arnoldus Montanus to illustrate the travel route taken by an official Dutch trade delegation to the emperor of Japan in the early 17th century. The map is essentially split into two sections, both oriented to the north. The upper map details the route from Osaka (Osadca) to Tokyo (Yedo) and identifies numerous ports along the way including Miaco (Kyoto), Quano (Yokkaichi? ), Mia (Nagoya? ), Suruga (Shizuoka? ), Iosinda (Kosai? ), and Odauro (Atami). It features two decorative title cartouches - one at top center offered illustrations of Japanese people, and another in the lower right wherein a cherubs hold aloft a flag bearing the distance scale. The second map, arguably the more important, details the routes between Osaka and Nagasaki. The map includes the islands Tonsa (Shikoku) and Bungo (Kyushu). This map is particularly interesting in that it twice labels the sea to the north of Nagasaki as the Sea of Korea (Mer de Coree or De Coreer Zee). The name of this sea is hotly contested between scholars in Japan and Korea, the former arguing for the 'Sea of Japan' and the later for the 'Sea of Korea.' In fact both names were used interchangeably in early maps with no clear preference. even so, the earliest usage of the term 'Sea of Korea' on a map is most likely in a Portuguese map created by Godhino de eredia in 1615. Subsequent 17th century usages were extremely rare and limited to only three or four additional maps – this Dutch map being one. An important map for anyone with an interest in the Sea of Korea / east Sea / Sea of Japan dispute. engraved by Jacob van Meurs for Arnoldus Montanus' 1669 Gedenkwaerdige Gesantschappen der Oost-Insische Maatschappy in't Vereenigde Nederland, aan de Kaisaren van Japan. Jacob van Meurs (c. 1620 - 1680) was a Dutch engraver active in Amsterdam during the second half of the 17th century. Van Meurs is best known for his collaboration with Arnoldus Montanus in the publication of numerous engraved maps and views for Montanus' various influential histories and travel narratives. Some of his most important works include a few of the earliest known views of the Americas (including New York City), Japan, and China. Montanus, A. Gedenkwaerdige Gesantschappen der Oost-Insische Maatschappy in't Vereenigde Nederland, aan de Kaisaren van Japan, 1669. Very good. Map has been professionally mounted to archival stock. List of Maps Containing the Areas Surrounding the Sea of Japan in the Bibliotheque Nationale de France, No. 41, Ge CC 1272(141, 2).